Images shot at ISO 100-400 show very little signs of noise in both the JPEG and raw files. Even when closely inspected, only slight luminance noise is visible in the raw files while the JPEG has this noise largely removed. Raw images at ISO 800 show slightly more signs of luminance noise, but this is minimal. The JPEG images show little signs of noise due to the in-camera noise reduction. Thankfully, at this ISO sensitivity a good balance between detail and in-camera processing is achieved. For JPEG shooters ISO 800 offers the best balance between high sensitivity without a great loss in detail. 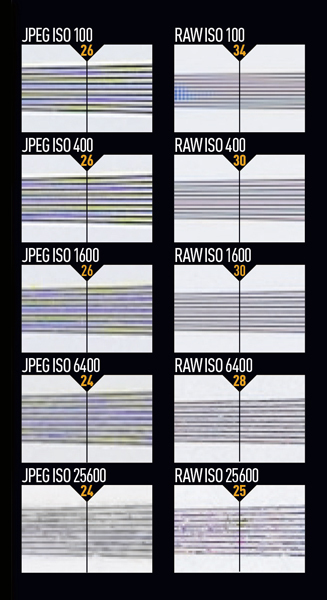 JPEG images up to ISO 3200 are usable, but they show signs of heavy in-camera noise reduction. This removes practically all the noise, but simultaneously removes much of the finer detail that results in a softer image. However, the raw files are still very good right up to ISO 3200, with mostly luminance noise present. Using Lightroom’s noise-reduction tools, a far superior level of detail can be achieved than the JPEG. At ISO 6400 in both the raw and JPEG files, luminance noise is evident on even small-scale images and chroma noise starts to creep in, getting progressively worse until the maximum ISO of 24,800. These images show 72ppi (100% on a computer screen) sections of images of a resolution chart, captured using the Samsung NX 85mm f/1.4 lens at f/5.6. We show the section of the resolution chart where the camera starts to fail to reproduce the lines separately. The higher the number visible in these images, the better the camera’s detail resolution at the specified sensitivity setting.